Samuel Bantien is a Breton agent and retired "locksmith" living a life of leisure in the Imperial City's Talos Plaza District with his wife Rochelle. 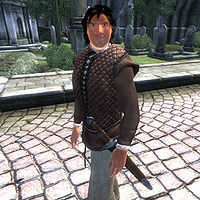 Samuel, the only basic Security trainer in Cyrodiil, is rumored to have a checkered past, although nobody knows the specifics. Samuel now lives a peaceful and relaxed existence where he enjoys the company of his wife and takes occasional trips to the Green Emperor Way, his favorite spot in the Imperial City. He goes to bed early every night at 10pm for eight hours of sleep and always starts off his day with a bit of wandering on the ground floor of his house. At 8am, he sits down at the dining table for a two-hour breakfast and an early morning chat with Rochelle. On regular weekdays (Morndas to Fredas), he leaves the house at midday and heads directly towards Green Emperor Way, where he spends all afternoon strolling around amidst the tombstones and occasionally talking with the many residents passing by. At 8pm, he makes his way back home to Rochelle and wanders on the ground floor until they both go to bed at 10pm. On Loredas, he stays home all day, just relaxing and conversing with his wife until his usual bedtime. On Sundas, he'll skip his usual trip to the palace grounds and head instead to the Temple of the One, where he will be found silently praying, his weapon removed, from midday to 4pm. He only offers training when he strolls around Green Emperor Way, making it impossible to receive any training during the weekends. On the 12th of each month, Samuel leaves his house at midnight and starts his long journey towards Bravil. He crosses the Talos Bridge before heading southeast on the Red Ring Road, passing the Ayleid ruins Fanacasecul and Vindasel on the way. Once he reaches the small settlement of Pell’s Gate, he turns south on the Green Road until he finally reaches Bravil after nearly fourteen hours of traveling. Once there, he enters The Lonely Suitor Lodge for two days of socializing and drinking. At midnight on the 14th, he leaves Bravil and travels all the way back to his wife in the Imperial City. During this entire trip, until his departure, his services will be available 24 hours a day. The only exception to this schedule is during Light the Dragonfires, when he is confined to his house. During his trip to Bravil, he defends himself with a steel shortsword. He wears a simple set of middle class clothing consisting of a pair of brown linens, a quilted doublet and a pair of russet felt shoes. He also carries his house key and five or six septims. Despite being retired, he is still willing to pass on his skills to the aspiring locksmith and will say so when you meet him for the first time: "Samuel Bantien. You want to learn a few tricks about Security, I’m your man." He will never reveal exactly what he did before settling down in the city, but he will hint at it when asked about his city of choice: "I only do the training any more. None of the rigs and tricks. Rochelle and me just want the settled life nowadays." The townsfolk have all noticed the Breton's advanced lockpicking skills. When asked for rumors they will say: "Samuel Bantien used to be a wild one. They say he used to be quite the 'locksmith. '", "Samuel Bantien used to be able to pick any lock in the city. He's settled down now, though." Inside the various inns they can also be heard gossiping: "Is it true that Samuel Bantien used to be a thief?" and even "Have you heard that Samuel Bantien has a bit of a checkered past?". Samuel's wife, Rochelle, is more than happy with her husband and his way of life: "I'm glad he's settled down to training and the quiet life." She will also say: "Samuel was a bit wild as a young man. The City will do that to you. Bad company, bad influences." Last but not least, notorious Blunt trainer Irene Metrick will define Samuel as one of the "right people": "To know the right things, you have to know the right people. Ida Vlinorman, Mandil, Samuel Bantien, and Othrelos are the right people."